The latest statistics show that almost 30% of those who reported making $10mm or more were audited last year. That's up substantially from the previous year when the number was closer to 18%. The rationale has to be that per dollar spent on audit, one can extract the most from the "1%". Auditing poor people is simply inefficient. 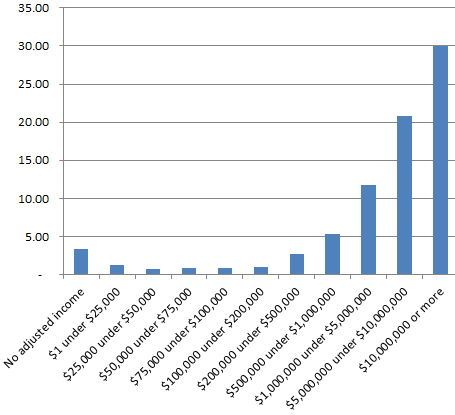 The chart below shows the percentages of people audited in each (reported) income bracket. Also attached is the full IRS statistics report.